Two Arizona Fingerpainters are celebrating a harrowing anniversary this month, marking one year from the day they didn’t die. 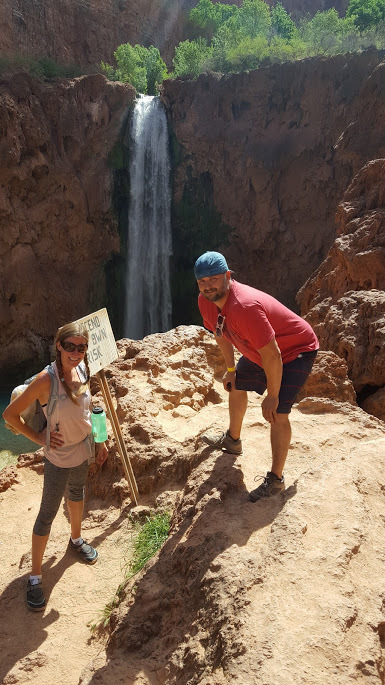 As most everyone knows, Arizona is known for its incredible winter weather and its remarkable natural beauty, so this time last year a pair of Fingerpaint colleagues decided to take advantage of both with the goal of living to talk about it. 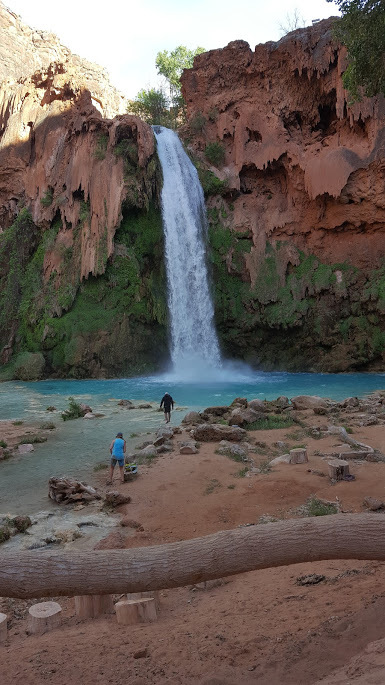 With virtually no camping experience or gear of their own, Josh Skalniak and Lisa Van Loo, both of whom are part of Fingerpaint’s public relations team in Scottsdale, packed the car and embarked on a life-changing, four-day, 40-mile adventure at the bottom of the Grand Canyon, where they experienced Havasupai Falls as part of a six-person expedition. The two decided that the experience of hiking and sleeping inside one of the world’s seven natural wonders would far outweigh any costs, like rented equipment, sore muscles, balance-bending cliffhangers, and dehydrated meals. Besides, they work with journalists at top-tier outlets, concept national campaigns, and develop shareable stories every day—so Josh’s fear of heights was nothing. As with most dramatic stories, the tandem trip almost wasn’t. Lisa had planned to go with the group and mentioned it to Josh while the two played softball for the agency’s team. Before they left the field for the night, Josh was in. After all, Fingerpaint embraces collaboration. Any life-changing trip comes with its share of life lessons, right? The first, for this, being that spontaneity can pay off, as both Josh and Lisa instantly agreed to go once they heard about it. Some of those lessons, spontaneity included, can bleed over to the work we do at Fingerpaint. Learn something new. 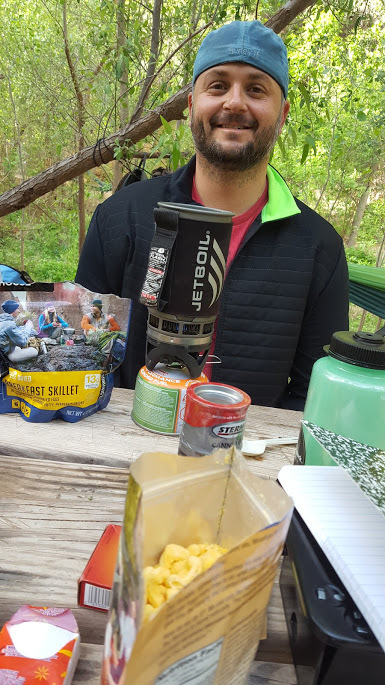 Before Josh and Lisa left for the trip, neither of them knew what a jetboil was or what it did. When they got hungry after a day of hiking through other-worldly waterfalls, they found out. And Josh was super happy about it. Just like when he learns about new tools and tactics he can use to help Fingerpaint clients connect with their audiences. He makes that same face. It’s good to be anxious. What can’t be seen in that photo is the people telling Josh and Lisa to step back from the edge, one of whom was Josh. But the photo just isn’t as great further back. It’s good to have that bit of giddiness about a new project or adventure, because it proves that it is important to you, not unlike the feeling of launching a new campaign or diving into a new client. Take a gamble. Carefully. 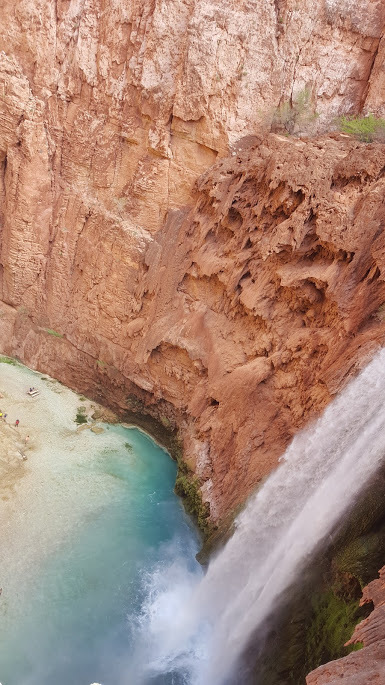 Josh wasn’t keen on the descent for that waterfall, which mirrored an Indiana Jones–style ladder nailed into the canyon wall, but the gamble paid off with a remarkable little oasis. Risk is part of growth, and at Fingerpaint we strike out on our own every day, making a conscious decision to never paint by number. Reward yourself. It’s not easy to climb into a canyon. 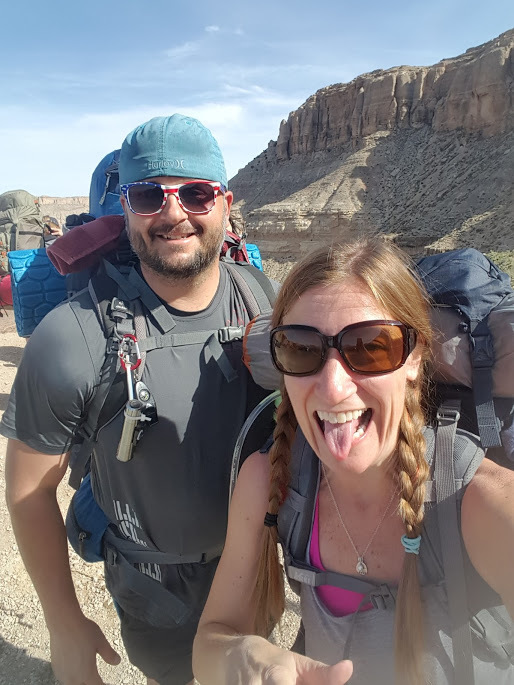 Just to get to the base camp, Josh and Lisa hiked 10 miles with all the gear they would need for four days on their backs. Once there, finding these waterfalls required less grueling, three- to four-mile hikes with slippery or steep access channels to reach them. The payoff was the crystal waterfall. Beyond industry awards, Fingerpaint makes a point to recognize good work and reward those who are doing it because it functions with a “People First” mantra. Find new perspective. It’s kind of easy to fall into a rhythm. To become robotic, knowing what works and what doesn’t. When that happens it’s so critical to find a new perspective. 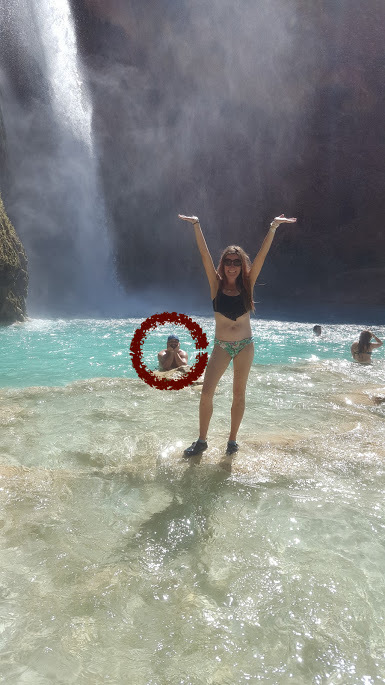 Josh and Lisa were reminded of how tiny they were on that trip in the canyon, and at work, Fingerpainters are constantly networking, expanding their expertise and venturing into new territory in an effort to grow and capture a new view of things. Laugh. Hard. A lot. At Fingerpaint, we work hard. And, we play hard. Jokes come just as easy in the office as they do at play, as Josh demonstrated with his goofy photo bomb. 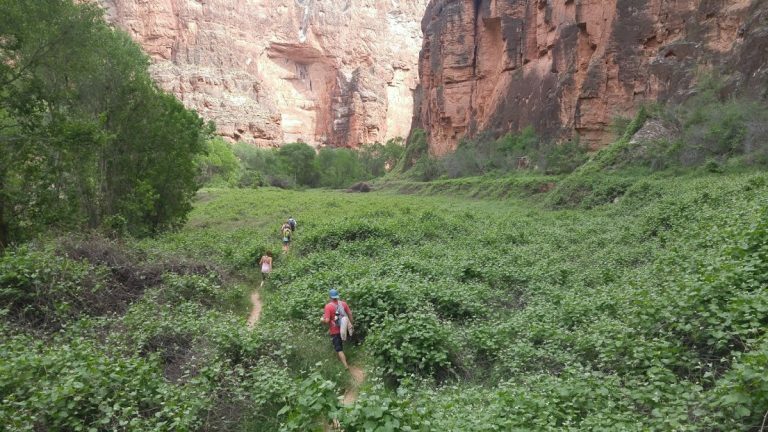 In Arizona, there is no shortage of outdoor adventures, and for that, we’re so lucky. So whether we’re laughing off a strikeout on the softball field, cracking jokes at a company outing, or finding humor in our quest to stay alive in the Grand Canyon, the one constant is a hearty laugh, sometimes strong enough to make our eyes water.